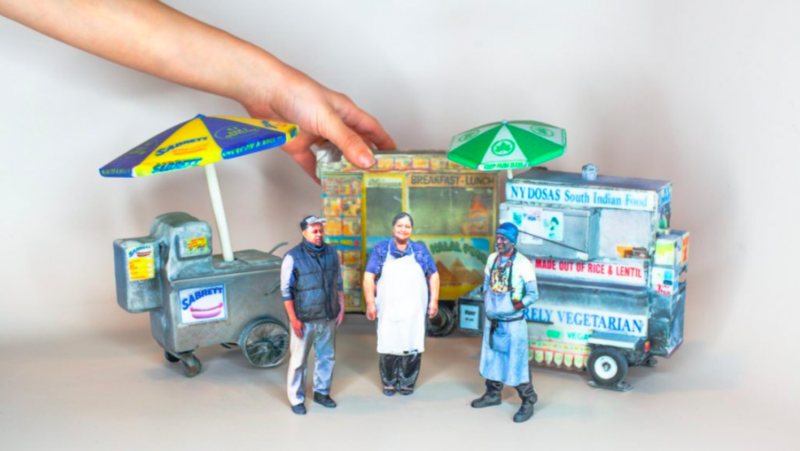 "Hidden in Plain Sight" shares stories of New York City street food vendors through interactive 3D printed sculptures of food carts and the people behind them. In this series of portraits, high-fidelity 3D scanning techniques were explored in order to use the physical models of the food carts as small canvases. Audio is triggered when the audience interacts with the piece and the vendors start sharing their stories. As the narrative unfolds, animations are mapped on top of the carts. The piece offers a new approach to documentary, merging older media formats with newer technologies.